For the second VanderbiltCupRaces.com post of 2009, I have improved the format of my December 31st post and added a rare 1924 aerial view. As seen on page 71 of our book The Long Island Motor Parkway, the first bridge over Winchester Boulevard was built in 1912 and used railroad-type trestle construction as required by New York City. In 1930, New York City decided to widen Union Turnpike to make it a major east-west road through Queens. However, the Motor Parkway in the area of Winchester Boulevard was in the path of the expansion. By an agreement among the city, the owners of the Motor Parkway and nearby Creedmoor State Hospital, New York City moved a section of the Motor Parkway further north of the original location. This agreement was described in a New York Times article on June 22, 1930. This photo shows pre-expansion Union Turnpike looking east on March 3, 1932. The buildings and chimney stacks of Creedmoor State Hospital are straight ahead and the Long Island Motor Parkway is to the left with the two bridges over Winchester Boulevard further east. In a close-up of the two Long Island Motor Parkway bridges, you can see that the new concrete bridge used the same design as three Queens bridges over 73rd Avenue, Hollis Hills Terrace and Springfield Boulevard (all still proudly standing!). This is the March 3, 1932 view from atop the old Motor Parkway bridge over Winchester Boulevard. An even closer look shows the ever-present line of concrete posts bordering the Motor Parkway. The newly-built section of the road is to the left. Finally, as noted in the New York Times article , a pedestrian bridge to Creedmoor State Hospital was also built over the Parkway further east of Winchester Boulevard. Click on the image and you will see the sign on the bridge reads: "STAY TO YOUR RIGHT". 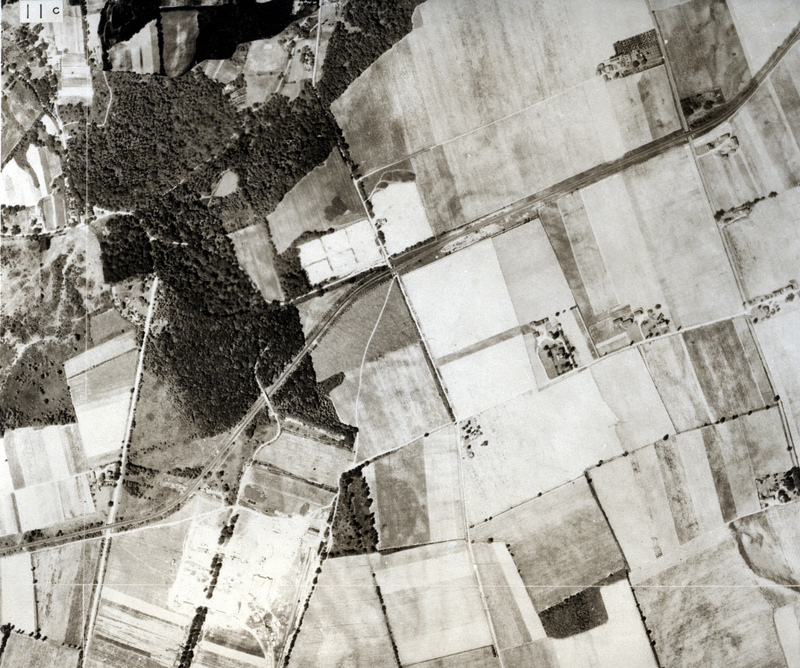 As shown in this 1924 Queens aerial, the pedestrian bridge replaced a farmway bridge connecting the many farms north and south of the Motor Parkway. From left to right, four bridges can be seen in this 84-year old aerial; Winchester Boulevard Bridge, the farmway bridge (which went over the parkway), Commonwealth Boulevard Bridge, and Little Neck Parkway Bridge. A Happy and Healthy New Year!!! north of bridge 4 on arieal photo little neck parkway, would that be what today is the Queens County Farmhouse Museum? You have a great web site and I appreciate all of the work you have put into it for my enjoyment. The photos on your web site are of great value, but are almost impossible to view with any clarity since you have place a large watermark and ‘X’ on each photo. Many of the photos are public domain or look like they were obtained from governmental agencies. If so, is there a need to make the photo’s unviewable for your readers? All of the photos on the Eastman Kodak archives web site are available to all viewers without watermarks. I do not think that anyone will be taking your photos and developing a web site using them. p.s. A few years ago, I attended a family event and stayed in a motel on a street that was once part of the track. I could almost hear the cars go by if I closed my eyes. Thanks for the positive comment and suggestion. Several of the images were given to me with the requirement that they could only be placed on the website with a watermark. When possible in future posts, I will try to obtain the rights to use images without watermarks. The article says that the new road was diverted 1,800 feet north of the old road. Yet the picture of the overpasses shows them next to each other. I guess the 1,800-foot distance was not at the point of Winchester Blvd. Is there any way to know exactly where the old and the new roads lay? You are correct. The two bridges appear less than 50 feet apart at Winchester Boulevard. The “two” Motor Parkways diverge farther apart as they approach Creedmor State Hospital. Next week, I will post several 19020s and 1930s aerials of this section.